The Numismatic Society of South Australia Inc. 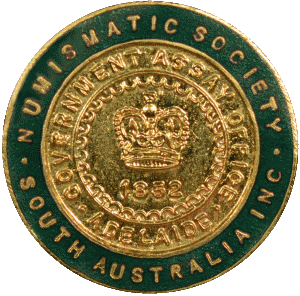 The Numismatic Society of South Australia (NSSA) promotes the collecting and the studying of all aspects of coinage and related subjects that come under the headings of numismatics and exonumia (or paranumismatics). Subject areas include Australian, New Zealand and world coins, banknotes, checks, tokens, medallions, decorations (civil and military), badges, share scrip, numismatic publications and reference books, and related paper ephemera. NSSA publications include an occasional Journal, and a quarterly Newsletter distributed to members. We meet on the third Thursday of each month (see our meetings page for more information) and visitors are always welcome to attend. Membership of the NSSA is open to individuals. The NSSA attends several local fairs in South Australia each year and holds regular visits for members to sites of both historical and numismatic significance in and around Adelaide.